Now that the Green City Market has opened my thoughts are turning to summer's bounty. My infatuation with pickling has awakened and I am eager to get started, and this summer I hope to add a little canning to the mix. I bought a large canning pot, the ring stand, and tongs last summer but could never quite commit to taking the plunge. So a friend and I have made the commitment to do it this year. Sometimes it helps to have someone to whom one is accountable to make sure one does the things one wishes to do. At least that is my dear hope. In the meantime, I thought I would post this easier recipe I adapted from the September 2006 issue of Gourmet (RIP) magazine. To be honest, the main adapting I did was to significantly reduce the number of vegetables I used. I think I am going to be a "less is more" kind of pickler. I like to have just two or three different vegetables pickled together. Of course that may change over time, but for now it seems to be my pattern. Since pickling the cauliflower and red pepper in the photo above, I have added garlic and beets to the mix. Red beets turn everything a lovely shade of pink; golden beets add a mellower golden tone to everything. I highly recommend either, or both. If you are new to pickling, this recipe is foolproof and the results are delicious. The only pickling ingredient you may not already have is the mustard seeds, and you should be able to find them at any grocery store.So what are you waiting for? Let's get pickling! In a 3-quart nonreactive saucepan, bring the first 6 ingredients to a boil over medium-high heat. Stir until the sugar is dissolved. Transfer to a large glass mixing bowl and let cool at least half an hour. Prepare a large bowl with ice and cold water and set aside. Bring 6 quarts of water to a boil in a large pot. Add the cauliflower and cook until tender but still crisp, about 4 minutes. Transfer to the ice water to stop the cooking. Cook the red peppers the same way and add them to the ice water bath. 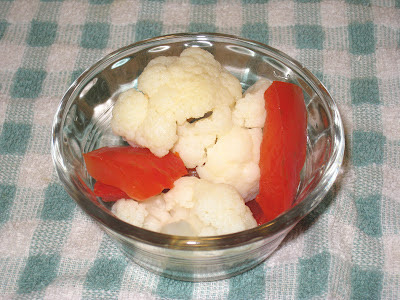 Add the cauliflower and the peppers to the pickling liquid. Weigh them down with a plate to keep them submerged, cover tightly with plastic wrap, and place in the refrigerator to chill for at least 1 day before eating.